Lauren Ash is a wellness visionary, yoga and meditation guide, engaging speaker and creative writer, and founder and executive director of the culture-shifting lifestyle brand synonymous with black women’s wellness—Black Girl In Om.Lauren’s contributions to the world ultimately reflect what she once needed and didn’t see. 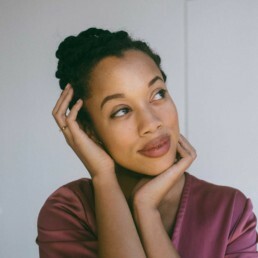 From the BGIO podcast—which has reached more than half a million listeners—to self-care sessions, her leadership in creating and cultivating meaningful experiences and content for a hugely marginalized community illuminate the compassion, care, and belonging that she affirms all women of color are deserving of. Since founding the leading platform for women of color on their wellness journeys in 2014, OWN, Nike, MAKE UP FOREVER, Wanderlust, HBO, and SXSW have partnered with Lauren—recognizing her as a trailblazer in contemporary wellness and having a tremendous influence on modern beliefs about mindful living and beauty.